This topic provides a brief explanation about Design Time and Runtime license key. 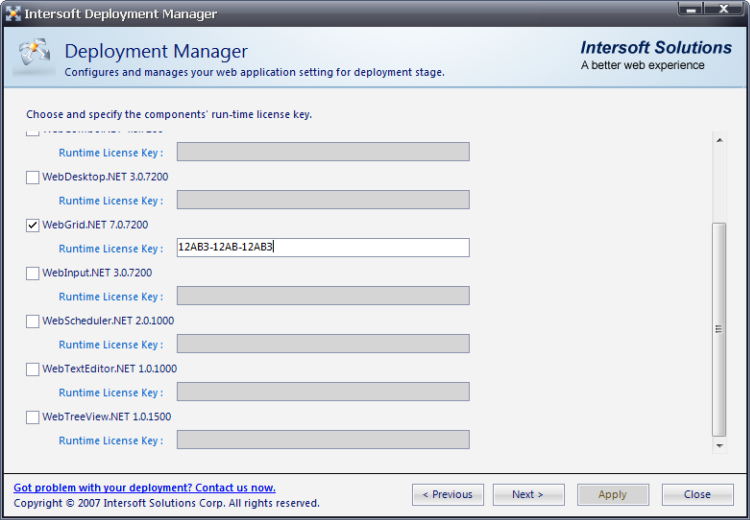 Every Intersoft’s controls come with two different license key, Design Time license key and Runtime license key. Design Time license key is a key required in development environment to change the trial suite into full-licensed. This key is obtained when you purchase Intersoft ASP.NET products and it is used only for installation purpose in development environment. You will be adviced to input the Design Time license key using License Manager in order to use the full version of Intersoft products. Runtime license key is a key required when you deploy the project that includes Intersoft products. This key is used to license Intersoft products for deployment purpose in production/deployment environment. 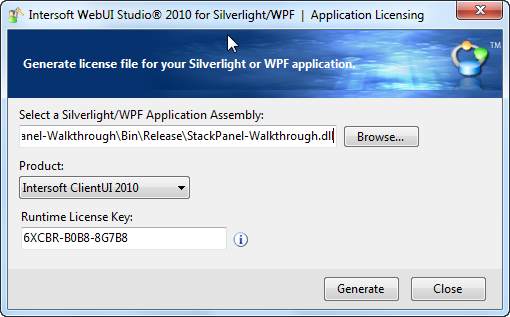 You will be adviced to input the Runtime license key during deployment using Deployment Manager (for ASP.NET products) or Runtime Application Licensing (for Silverlight/WPF products). Please obtain each licensed component's Runtime license key from Intersoft Developer Network under My Component section. You only need to obtain once and reuse it in multiple projects. The login detail is provided in your purchase receipt. If you purchased from our resellers, it may take 24-48 hours for the verification and account creation process.